Negative stereotypes towards heavier individuals starts to affect long-term life opportunities from a young age. A number of studies in recent years have suggested that bigger children fare less well in school than their slimmer peers. The Avon Longitudinal Study of Parents and Children followed nearly 6,000 children in the south-west of England and found that higher body weight at age 11 predicted lower scores on standardised tests at age 11, 13, and 16. This was particularly the case in girls, and a decline that was not explained by lower IQs. 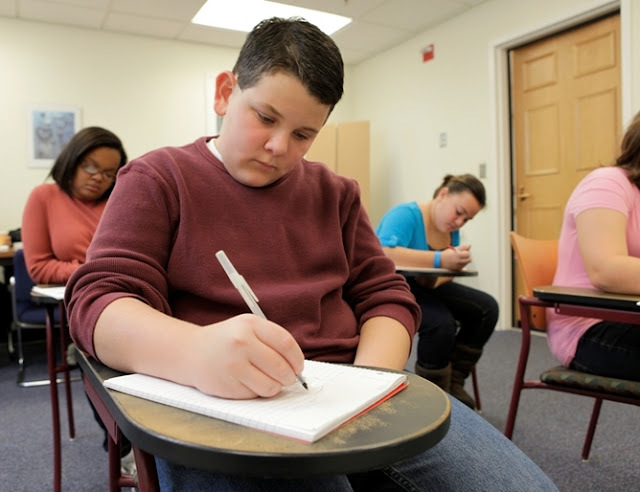 Other studies, mostly conducted in the US, have reported similar findings, suggesting that students classified as “obese” tend to be awarded lower grades than their peers in both secondary and tertiary education, despite no differences in intelligence or conscientiousness, and no actual difference on standardised tests of maths or language ability. So are fatter students really under-performing in school, or do their teachers just think they are? And why? The answer is probably a bit of both. Researchers think low expectations and anti-fat attitudes among teachers probably play a role. Some of the existing research has been criticised for taking a cross-sectional approach, like a snapshot at a point in time. This makes it impossible to tell whether low expectations are leading to under-performance or if it’s the other way around. But a new study published by a team from the Harvard School of Public Health may help to answer this question. The researchers followed a nationwide cohort of kindergarten children for around ten years. This particularly study looked at how weight change between the ages of ten and 14 affected teacher ratings of the children’s abilities, taking a range of other factors like socioeconomic status, family situation, exercise and television time, and so on, into account. More than 3,300 children completed standardised tests of maths and reading ability at age 10-11 and at age 13-14. The researchers found that weight gain had no effect on test scores, but it did make a difference to how teachers rated the students’ academic competence. In all cases, as weight went up, evaluations went down, although the figures only reached statistical significance for girls’ reading skills and boys’ maths skills – a difference that might be down to gender stereotypes. Teacher perceptions of boys’ reading ability decreased more if the boys had been heavier to start with, compared with those who were only just starting to gain weight. There were also small decreases in the children’s own perceptions of their abilities, although these were mostly not statistically significant. But in girls who had been classed as overweight at age 10-11, gaining weight resulted in quite a large reduction in their own confidence in their maths skills compared with how weight gain affected girls who hadn’t been classed as overweight to begin with. Although this study didn’t assess the actual anti-fat attitudes of the teachers – meaning it’s not possible to link the two directly – numerous other studies have now reported negative weight-related stereotypes and anti-fat attitudes being held by teachers at every stage of the school system, from kindergarten upwards. Although most studies, including this one, don’t find any decrease in academic ability with weight gain, it is possible that in some cases, fatter children do under-perform in class. It seems likely that at some point, lower expectations and lack of confidence will start to impact on actual in-class behaviour. And this isn’t the only problem. Peer bullying and teasing because of weight is widespread, up to and including physical attacks, and the problem only seems to be getting worse. Reports of weight-related bullying and discrimination from teachers and professors are on the rise. Unsurprisingly, one study that looked at the effect of weight-related bullying on academic performance found that it explained much of the association between higher weights and lower achievement. These early disadvantages have serious implications. First, there is the direct psychological cost of this hostile environment, including greater rates of anxiety, depression, and suicide among heavier young people. A recent study even suggested that bullying may be more harmful than child abuse in the long-term. But there is also a cost in terms of more limited life opportunities. In general, heavier individuals tend to have fewer years of education overall, are less likely to go on to higher education, and are less likely to get into graduate school. In all cases, the effects seem stronger for women and girls and negatively impact them at every stage in their careers. In fact, the research in this area tells us that heavier individuals, and in women in particular, are less likely to be hired, more likely to be disciplined or fired, receive poorer performance appraisals, and earn less money for the same work. Given the impact on both education and employment opportunities, it is perhaps not surprising that higher-weight individuals are also more likely to belong to lower socioeconomic groups, as confirmed by the latest Health Survey for England data. We need to halt this downward trajectory. It is not uncommon for researchers to call for increased awareness of the “detrimental impact of obesity on educational achievement”. But this just adds another layer of stigma onto already disadvantaged children. We need to be focusing on the detrimental impact of the way heavier children are treated on educational achievement. We need better teacher training, stronger anti-bullying measures, and programmes to teach diversity and respect for all.